I am a sucker for girl-in-a-spooky-house stories, so Guillermo Del Toro doing romantic gothic horror is a deliriously enticing prospect. 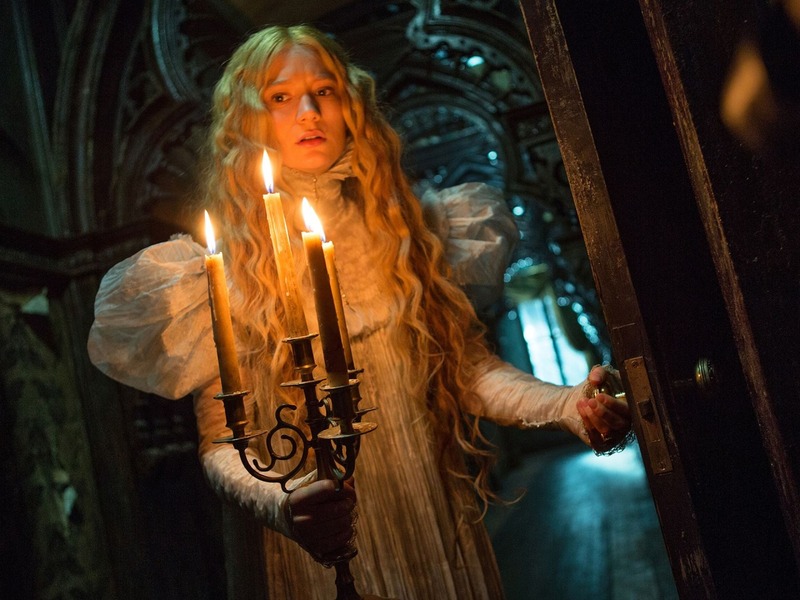 The good news is that for the most part Crimson Peak works very well. Yes, there’s nothing particularly original about it, but for fans of Del Toro’s uniquely sumptuous visuals, the film is an eye-popping treat replete with all the melodramatic blood, thunder and passion one expects from the genre. Mia Wasikowska plays the aptly named Edith Cushing (Cushing being a neat nod to the late great Peter Cushing, stalwart of so many Hammer Horror pictures). She is an aspiring novelist and daughter of a successful American businessman, to whom impoverished English baronet Thomas Sharpe (Tom Hiddleston) approaches to secure funds for his clay mining business venture back in England. Thomas also woos Edith, though it is hardly a spoiler to state his intentions, and that of his icy sister, Lucille (Jessica Chastain) are dubious. As a child, Edith was warned by the ghost of her late mother to “beware Crimson Peak” so when events eventually lead to her taking up residence with Thomas and Lucille in this spectacularly sinister establishment, the viewer is primed for things to go bump in the night. Said bumps are effectively delivered, with Del Toro referencing everything from Hammer horror pictures (especially its garish use of really red blood) to Daphne du Maurier’s Rebecca, the Bronte Sisters (particularly Jane Eyre), Susan Hill’s The Woman in Black, and even his own earlier movies (especially The Devil’s Backbone and The Orphanage, which he produced). Tom Hiddleston, Mia Wasikowska and Jessica Chastain are all good (especially Chastain) and as expected with any Del Toro film, the art direction and sets are astonishing. Del Toro’s use of red is luridly effective, whether it’s blood red clay seeping from beneath floorboards, down walls or into the snow, sinewy covered apparitions, or else the afore-mentioned actual blood, of which there is plenty. Speaking of which, the usual warnings for this sort of thing apply – ie some moderate scares, sexual content and plenty of quite gruesome and at times wince-inducing violence, certainly on a par with the nastiness contained within Del Toro’s masterpiece Pan’s Labyrinth. As with many ghost stories (including previous Del Toro movies), well-intended but frankly misguided Christians will no doubt take pot shots at the “theology”, misunderstanding that, duh, it’s a story not a sermon. The macabre prospect of restless departed spirits interacting with the living to bring about justice remains a perennial and understandably popular fantasy, and with that in mind this film hits the usual emotional buttons to satisfying (if “theologically inaccurate”) effect.